LalBrew® London is a true English ale strain selected for reliable fermentation performance and moderate ester production that lets the flavors and aromas of malt and hops shine through. 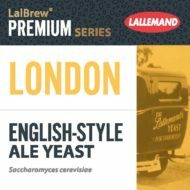 LalBrew® London was selected from the Lallemand yeast culture library, and is an excellent choice not only for brewing Extra Special Bitter but for other authentic heritage UK styles like Pale Ale, Bitter and Mild. LalBrew® London may also be used in the production of Ciders.